The day before the United Nations vote on Palestine, UK foreign secretary William Hague was explaining his devious policy to Parliament. “We support a negotiated settlement leading to a safe and secure Israel living alongside a viable and sovereign Palestinian state; based on 1967 borders with agreed land swaps, Jerusalem as the shared capital of both states, and a just, fair and agreed settlement for refugees. It’s always a “safe and secure” Israel and only a “viable” Palestine, never the other way round. A Palestinian state, it seems, cannot expect to be safe and secure – it must be vulnerable at all times. He was desperate to extract a promise from President Abbas not to bring charges against Israeli war criminals, not to go for full UN membership, and to submit once again to direct negotiations. “We judge that if the Palestinians were to build on this resolution by pursuing ICC [International Criminal Court] jurisdiction over the Occupied Territories at this stage it could make a return to negotiations impossible. And what’s on the ground, of course, is vitally important. In the past, off-on slow-grinding talks have bought Israel time to establish irreversible fact on the ground that have already rendered a viable Palestinian state impossible and are designed to make the occupation permanent. It has worked like a charm for Israel for the last 20 years… and Hague knows it. And he surely knows that nothing worthwhile is likely to be achieved by a strong side bullying a weak side – by an Israel bristling with weapons of mass destruction facing a defenseless and impoverished Palestine across a negotiating table. It’s both obscene and immoral. I haven’t yet heard a convincing argument for returning to such a lopsided and discredited scenario, especially while Israel’s land-grab and colonization continue. The way forward is already set out by international law and numerous UN resolutions, which are still waiting to be implemented. Therein lies justice. Direct negotiations require Palestinians to make “compromises” and give away what little is left of their lands and resources to a greedy, merciless ‘peace partner’ that has abused and humiliated them for 64 years. What justice can possibly come out of that? A word search shows that Hague made no mention of the fact of the occupation nor did he call on Israel to end it. He expects Palestinians to return to talks with Israel’s jackboot still on their neck and while the Zionist regime maintains its illegal blockade. In case you’re wondering what nationality Hague is, he was recruited into the Conservative Friends of Israel at the impressionable age of 15.
International law and UN resolutions are never mentioned Israel and the US and other opponents of the bid such as Hague keep saying, ad nauseam, that a Palestinian state should emerge only out of bilateral negotiations. They complain that the Palestinians are bypassing the negotiation process set out in the 1993 Oslo peace accords and going direct to the UN for statehood. But those accords were of no benefit to the Palestinians. If the West had wanted to sow confidence in the negotiating process they would have ensured a measure of success – they had the leverage to do so. Confidence evaporated long ago not only in the process itself but also the gang of dishonest brokers promoting it. Palestinians could argue that Israel and its allies are trying to bypass the law. Why shouldn’t the Palestinian question now go back to the international community for determination within the parameters of key UN resolutions and international law? That step must come before so-called negotiations, surely. The US and Israel would cut up rough but – who knows – the other states might discover a collective backbone. On his big day Abbas trumped all of Hague’s mean-spirited delaying tactics with simple good sense, saying: “It is time to move forward – that is why we are here today.” The UN, he said, had a moral duty that couldn’t stand further delay. He invited member states to issue a birth certificate for the the emerging Palestinian state. Delegates stood and clapped. A sour United States representative called the vote “counter-productive” and warned that Palestinians would wake up in the morning to find “the prospect of a durable peace had receded”. If so, no-one will be in doubt that it’s largely America’s fault. 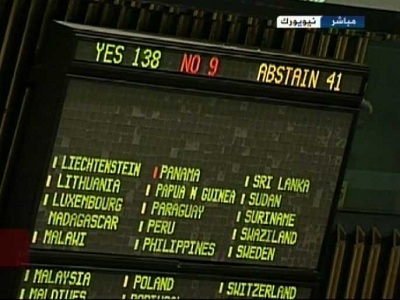 Great Britain explained that it abstained because it received none of the assurances demanded of Abbas. In other words the blackmail failed. It was very noticeable how so many delegates were reading from the same script word for word. The mantra: “only through direct negotiations without preconditions” was tediously repeated throughout the proceedings. That insistent phrase “without preconditions” presumably means without reference to international law and the pile of unimplemented UN resolutions. But the world outside, I suspect, is tired of diplomatic claptrap and will see the vote as a long-overdue turning point.